The story behind this DVD/2CD package is an interesting one. Dennis DeYoung returned to the El Ray Theatre in Los Angeles for his first gig on the American West Coast since he began his solo career, some thirty years earlier. The tickets for this sold-out show were priced at a fan loving $5, this was a thank you from DDY for their long time support, and the people began to queue for this concert hours before the doors opened. The whole thing was recorded for posterity by AXS-TV and captured in pristine HD quality; and you will all soon be able to get your hands on a copy of this truly wonderful concert. Now there are a few reasons why this gig is special. Firstly the band of Mr and Mrs (Suzanne) DeYoung, August Zadra, Jimmy Leahey, Craig Carter, Tom Sharpe and John Blasucci are on fire throughout the hour and forty minutes that they are on stage. Close your eyes and it sounds like Styx are once again playing together. Secondly, as the man tells us, he's sixty-seven years old (when this was recorded) and I haven't heard him sound better; the vocal range, power and sheer enthusiasm he still has belies a man of his age. His stage presence and the witty banter between him and the audience is great to witness and you can tell that this man still has all the passion, drive and love for the incredible music that he helped create. Finally there's Zadra (I'm sorry to say I hadn't heard of him until I watched this DVD) who is outstanding both as a guitarist and a singer. When he takes on the Tommy Shaw songs 'Blue Collar Man', 'Crystal Ball', 'Too Much Time On My Hands' and others, you can see and hear another guy who has a genuine love for this music and relishes (as does the rest of the band) performing it. 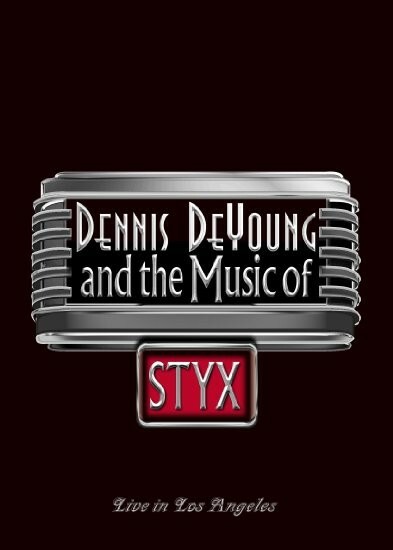 So what does a night with Dennis DeYoung 'And The Music Of Styx' actually entail? Well fans of DDY and Styx get ready because what's on offer is nearly two hours of Classic Rock songs played by a fantastic band, with a singer who is still at the top of his field. Here's the set-list to prove it – 'The Grand Illusion'; 'Lady'; 'Lorelei'; 'Blue Collar Man'; 'Show Me The Way'; 'Mr. Roboto'; 'Crystal Ball'; 'Don't Let It End'; 'Too Much Time...'; 'Desert Moon'; 'Babe'; 'Foolin' Yourself'; 'Suite Madame Blue'; 'The Best Of Times'; 'Renegade' and Come Sail Away'; and if that doesn't get you excited then you are definitely reading the wrong magazine. Also even if you put that amazing set-list to one side, you'll still be witnessing a band that are playing and performing at the height of their combined powers, which makes the whole concert even more enjoyable. Plus you get a double CD of the whole thing included for a great price and for perfectionists, there's a Blu-Ray version as well. So summing up, sixteen classic songs, pristine audio production values, shot in Hi-Definition and 'Come Sail Away' as an encore, what more can I say... except buy!